What Is A SSA-632-BK Form? No matter for what reason you receive a payment from Social security you may be overpaid. Commonly, administration notifies if this happens. There should be given the reason of overpayment and the ways you can pay back if you agree that you received more than you should. To solve this issue fill out SSA-632-BK form. It is also known as Request for Waiver of Overpayment or Overpayment Recovery or Change in Repayment Rate. By completing this document you have three ways to find a solution. First, you may reconsider the decision of the authority service, if you believe, that there was no mistakes with remuneration. Then, it may be possible to pay back the amount at a different rate. Finally, you may refuse to give back money. In any case, it is necessary to give sufficient information about fault and financial circumstances. So find a SSA-632 BK template and fill it out with necessary details to satisfy all the requirements. 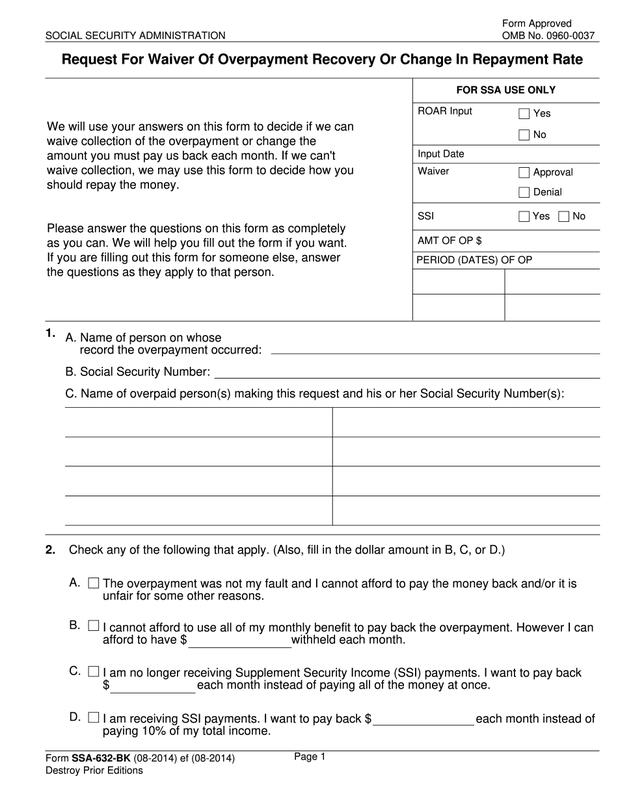 Page 1: provide identifying data and the reason of completing the form. Page 2: collect information to determine your involvement in the situation. Page 3: add a detailed description of your income and assets from all sources and the expenses of the household. You are provided with ability to send the document via email or sms after completing. © 2019 ssa-632-bk-form.com. All rights reserved.